Dive in to an amazing holiday in paradise where marine life encounters and endless turquoise vistas thrill all the senses. 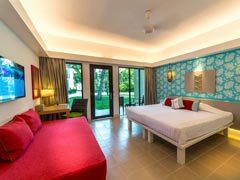 Discover new ways to play and unwind at Club Med Kani Maldives Resort. With seemingly infinite possibilities to ignite excitement and pursue your passions, revel in the best Maldives all-inclusive resort amid 2-kilometres of powdery white beaches, swaying palms, and exhilarating underwater adventures. Whether partaking in new pursuits or diving into a favourite pastime, the resort’s unmatched offerings make every day worth celebrating. 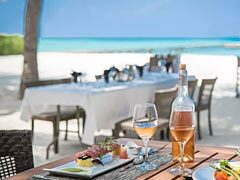 From snorkelling with schools of tropical fish, to paddling through crystal clear waters, or dining on international culinary creations and freshly caught seafood, a holiday here is simply unforgettable. Delight in a variety of dining options to suit every taste—morning, noon, or night. From casual small plates to international cuisine and waterfront views, each restaurant offers something for everyone. 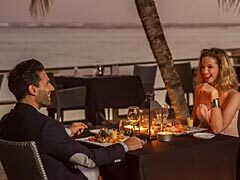 Set in the shade along the azure waters of the lagoon, encounter a relaxed yet refined dining experience for all the senses. 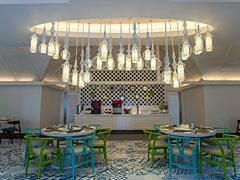 The Kandu offers a la carte and buffet breakfast menu options such as fresh fruits and pastries, cereals, pancakes, and egg dishes. The restaurant also serves two evening menus, including one lobster menu served with foie grass or sashimi. 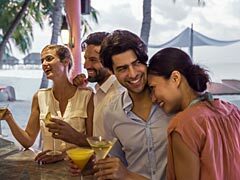 To drink, beverage selections include wine, beer, and soft drinks. Specializing in light bites, Kaana offers a delicious selection of Asian soups, tapas, sandwiches, and a variety of small plates to savour. Open all day and into the evening, this restaurant’s casual yet sophisticated backdrop invites memorable meals shared together. 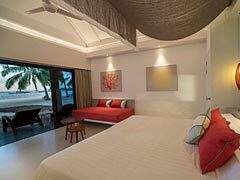 Located in the heart of a private island in the Maldives, Club Med Kani invites guests to choose from its vibrant yet cozy accommodations set in either the lush natural gardens or directly on the sandy beach with unspoilt ocean views. At Club Med Kani, children enjoy a place all their own. Children aged 4 to 10 and 11 to 17 can take part in a variety of games, sports, and creative activities with a dedicated G.O® by their sides every step of the way. Here, young adventurers can learn through play with activities such as cooking lessons, face painting, sandcastle making, and coral propagation. Children ages 6 and up can even dive into challenging water sports like sailing and kayaking. Dive into the excitement with Club Med Kani’s unmatched water sports and activities. Offering group lessons and guidance for all skill levels, beginners and experienced athletes alike can enjoy state-of-the-art equipment and exclusive guidance from knowledgeable G.O.®s. Club Med is the largest sports school in the world with over 60 sports taught worldwide. At our Maldives resort, the sailing and fitness schools are unparalleled. Service Included: Fitness School, Sailing School, Badminton, Beach soccer, Beach volleyball, Snorkelling (from 11 years old), Table tennis, Yoga, Waterpolo, Aquafitness, Weights & Cardio room, Kayak, Swimming pool, Stand up Paddleboarding. Service Extra Charge: Scuba diving, Waterskiing & Wakeboarding, Big game fishing, Surfing, Flyboard. Welness Mandara Spa: Retreat to a blissful spa escape to pamper the soul and rejuvenate the body. Step into a space of pure relaxation where a variety of body and beauty treatments have been created with you in mind.